According to the new report by IMS Research - World Market for Wearable Technology - increasing demand for wearable devices will leade to a market volume of an estimated $6 billion. 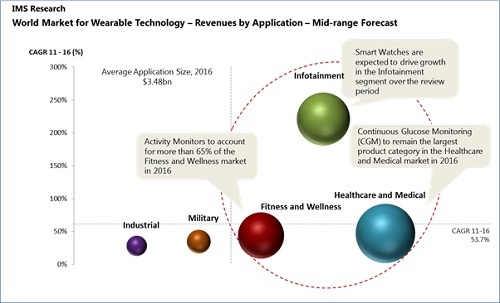 While current wearable technology focusses on applications in the healthcare, medical, fitness and wellness area, new applications with strong impact will be more consumer-driven, such as Smart Watches, Smart Glasses as well be used in muilitary and industrial applications. Theo Ahadome, senior analyst at IMS Research, explained that "“A $6 billion market in 2016 is our most conservative forecast", assuming that the adoption of wearable technology will be limited by certain factors such as the availibility of suitable technologies, user compliance or limited user experience preventing the adoption of these new applications.